People will do what they know. It's inescapable. When the spotlight is on, and you are expected to perform, most people are going to go with a tried and true response, not an untested experiment with unknown risks. In the context of engineering, people will tend to use designs, architectures, and tools that they've used before. It's entirely natural and rational, and in most cases going with a known design will yield predictable results. But that is not always the case. Sometimes adhering to what you know can lead to some prickly design traps. Probably the worst of these is NIH (not invented here) syndrome. In its strongest form, this disease presents itself as a team's complete inability to accept design components or subsystems from anyone else, even within the same company. Everything must be designed and implemented in-house from the ground up. In weaker forms the team may use some standard libraries and frameworks, but the default state of their design process is still roll-your-own. NIH normally becomes a problem only if the entire design team is afflicted. If a minority of designers have this tendency, they can usually be overruled or have the impact of their decisions minimized. But if company culture is saturated with this mindset, teams will have an awful lot of work to do. Another design trap born of only doing what you know is forcing a solution to fit the problem. If the design warrants a solution that doesn't exist in your repertoire, and you don't take the time to properly understand the problem and research its design space, you may end up trying to use a design that is ill-suited to the problem or solves an entirely different problem. This is the classic case of trying to fit a square peg into a round hole. It can't be done without significantly distorting the peg or the hole or both, and the result ain't gonna be pretty. Possibly the most common trap is plain old suboptimal design. You may know a decent solution that fits the problem, but a better one exists that makes the design more elegant or more efficient or more flexible. The better solution could be an algorithm, architecture, or framework that you put off learning or are not yet aware of. You end up using the suboptimal design because it's what you know, and it can happen at any level of design. All of these traps have something in common. They can be disarmed with the will to learn what you don't know. If you adhere to only those concepts you already know, it is easy to fall into one or more of these traps, but if you are determined to research the problem at hand, deepen your knowledge of the application domain, or experiment with new tools on the side, you can overcome the pitfalls and make better design decisions. Let's examine each of the traps listed above in reverse. To avoid suboptimal design, the simplest thing you can do is take a look at what others have already done to solve the problem you're working on. It is almost a certainty that someone else has already run into the same problem, solved it, and published the solution for others to use. It's almost as likely that multiple solutions are out there for you to choose from, if you use some creativity. Leonardo da Vinci invented armored vehicles, helicopters, and hang gliders in the 15th century, long before engineers built functional versions of them. He worked out a lot of the main design problems before the materials and manufacturing processes even existed to make his inventions a reality. If he could do that centuries ahead of time, it's probably safe to assume that almost all problems have already been solved in some context. Most innovation today is the refinement of those solutions or the application of those solutions to new fields. Your problem is probably not so unique that nobody has come across it, yet. Spend a little time looking around before diving into a solution that may be suboptimal. Forcing solutions to fit the problem can be thought of as a more extreme case of suboptimal design. To avoid this pitfall, try learning more about the problem domain first. The more you know about a domain, the more you come to appreciate its subtleties and nuances, and the more likely you will realize how it is different from things you have done in the past. For example, on the surface, system modeling and real-time signal analysis seem to have a lot in common. They utilize many of the same DSP concepts, but the details are what set them apart. In a real-time system, a lot of effort is put into streamlining calculations with multiple stages of computation separated by memory buffers to relax timing constraints. In contrast, a system model is attempting to accurately model a real system on different hardware while making simplifying assumptions to speed up the execution of the model. Even though they may be performing the same calculations, the different constraints of the two problem domains will make the solutions' architectures drastically different. Even within each of those domains, the constraints of the specific problem being solved is important, and slight changes to the requirements can have a ripple effect on the rest of the system. Learn more about the problem domain to avoid the misapplication of an old solution to a new and different problem. And now we arrive back at NIH syndrome. Things get more complex here because simply learning more about the application domain or researching solutions to the problem at hand will not dissuade someone from writing their own solution. There is a certain comfort and familiarity in writing your own code that is difficult to overcome. You know the code inside out because you wrote it. You can debug it and fix it if there are problems. And let's face it, your code is a gold-plated work of art while every other programmer's code is crap, right? Let's discuss this a little in the context of an example from the video game industry. When embarking on a new game design, one of the basic choices that needs to be made is whether to license a game engine or build your own. If you build your own, you own it for better or worse. It's your own code, and you have total control of it and full knowledge of how it works. But you have to start at square one and it's going to take time to develop. If instead you license an existing game engine, you can start with known working code that hopefully comes close to your needs. You have to pay for it, but having a working engine can be a huge asset. And depending on the support you can get, you could have a robust platform with critical help for developing your game. So how do you choose? Well, even if you license the engine, you're probably going to be changing it quite a bit and writing lots of code. You're going to learn a lot about that engine by the time you're done. Then on the next game project, it will be something you already know - another tool in your programming toolbox. If it was acquired with less time and effort than a home-built engine, that's a big win. If it came from a blockbuster game, it's already been tested and proven in the wild, another big win. I'm not saying that licensing game engines is always the way to go. Sometimes existing engines don't fit the requirements or they're too expensive. The details of each project are important. The point is that the decision should be made using careful analysis of the project's requirements and constraints, not dictated by a team suffering from NIH syndrome. Knowledge of multiple game engines helps tremendously in that decision. The same is true for any software project when deciding whether to write your own code or use existing libraries and frameworks. The deeper your knowledge about what's already out there, and I mean functional knowledge that comes from having already used the tools under consideration, the more informed you are in making that decision. Knowledge is power. Because people tend to do what they know, you need to keep learning what you don't know to make better design choices. The pursuit of knowledge is never-ending. Get comfortable with that. Every tool you can add to your programmer's toolbox is an asset that you may find useful at any time, and you want to keep freshening and maintaining your toolbox, lest you be caught by a problem for which you have no ready solution. And the best tools in your toolbox? An inquisitive mind and a will to learn. In my continuing effort to draw connections between programming and every other activity in my life, I thought I would tackle the similarities I see between programming and juggling. I find that juggling is a pretty fun way to kill some time when I don't have the time to do anything more involved. It's relatively easy to find three or more relatively small round objects that I can try to keep in the air. Since I have a couple of small children, I can generally look down at my feet and find a multitude of toss-able things readily available on my very own floor. Building blocks, plastic eggs, wooden fruit - it's all fair game, and entertaining for the kids as well. I once tried using a couple of medicine balls, but that didn't work out so well. Balls that heavy tend to screw up your tosses, and boy do your arms get tired fast. I suppose they would be good for training to juggle chainsaws, though. Juggling has some nice advantages beyond wasting time. It improves your hand-eye coordination, reflexes, and spacial awareness. It's a neat party trick, for kids at least, and looks pretty impressive once you get a few tricks beyond the basic three-ball juggle under your belt. Okay, enough about the virtues of juggling. How does it relate at all to programming? You have to keep multiple balls in the air. And when those balls are in the air, there is a lot going on. Your eyes are spotting which ball to catch next. Your hands are adjusting to where the balls are going to land. You're launching the ball you just caught so that hand is free for the next ball that's already on its way down. Each of your hands and your eyes are acting independently, but they are still connected through the paths of the balls and acting synchronously. At no point can you be aware of everything that's happening at once. Your hands have to know what to do and react without conscious thought. With programming, you are juggling with your mind instead of your hands, and you have to keep numerous variables, functions, and processes in the air at the same time. The bigger the program, the more that's potentially going on at once. If you had to consciously think about everything, you would have a hard time making progress. You have to depend on your mental reflexes to retrieve the necessary information at the right time for the particular code you're writing. If you have to constantly jump around the code to remember which variables do what and where that other function is called and what were the side effects, you're dropping the balls instead of keeping them all in the air. Consistency and accuracy are your two best friends. When learning to juggle, one of the first things you have to train yourself to do is throw the balls exactly the same height and distance every time. If you watch a good juggler, the balls or rings or clubs will all travel along exactly the same path as if they are wired together. When they deviate from that path, the juggler is either inserting a quick trick into the juggle, or he is transitioning into a different juggle that will become the new path. A routine is made up of a series of transitions from one steady state to another with slight deviations thrown in to surprise the audience. 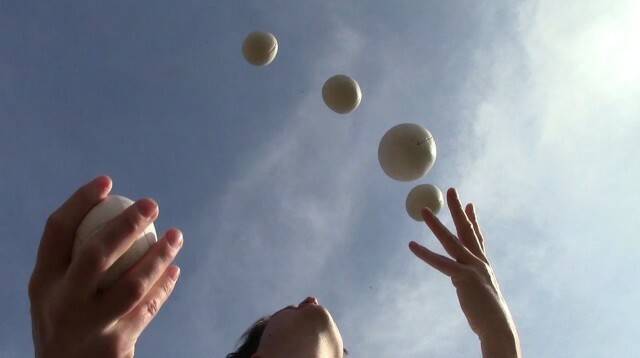 The absolute consistency and accuracy of every single throw allows the juggler to think at a higher level about the next part of the act instead of how to throw and catch each ball as it's happening. That ability to step back from the basic mechanics and let the subconscious take over allows a smooth, dynamic performance to happen. The same principles free a programmer to think at a higher level. If you consistently use the same design patterns and conventions when you're programming, you can do more forward thinking. You can get to this state of mind more easily by adopting standard naming conventions, method and class structures, and coding style. Once you are thinking less about what to name things, what you did name things, and how to structure code, you can relieve your mind to concentrate on achieving your goals. Increasing your accuracy frees up even more time that you were spending correcting compiler errors and simple coding bugs, leaving more time for higher level thinking and design. Juggling requires efficiency of motion. It's quite tiring at first. It seems like you have to move your arms and hands in a dozen different directions, as if they need to be everywhere at once. After a few minutes all of your muscles get pretty worn out. As you get better, you figure out how to combine separate movements into more fluid motions that conserve energy and use the momentum of the balls to your advantage. As you move your hand to catch a falling ball, you let your wrist relax at just the right moment to load it like a spring and then bring your forearm in slightly and relaunch it to your other hand with a light flick of your wrist. You make less course corrections and all of your movements get smaller and more focused. Eventually you have all of the time in the world to catch the next ball, and you conserve your energy to keep juggling for much longer stretches of time. In programming, efficiency of motion would apply directly to typing skills. That much is obvious, but let's cast our net a little wider. Efficiency of motion also applies to the entire programming environment. Take the time to learn the shortcuts of the operating system, IDE, and editor you're using. The more efficiently you can move around your programming environment, the faster you'll be able to program, and the more mental energy you'll have to put towards programming better. Whenever you find that you're making a course correction by interrupting your coding flow to accomplish some task, take a little extra time to see if there's another way to do it that will flow more smoothly. Eventually you'll be able to dance around your programming environment much more efficiently, spending less time wrestling with the environment and more time writing great software. It is hard to learn new tricks. Once you have the basic three-ball juggle down, you'll want to expand your repertoire. Maybe you want to learn to juggle two balls in one hand or sneak a throw behind your back. You'll quickly find that every new trick is practically as hard to get right as the original three-ball juggle. Your hands have no idea what to do, and you have to force them to move where you want them to go because they will no longer do anything right on their own. Suddenly, juggling takes all of your mental focus again. More than in any other activity I can think of, in juggling it is difficult to learn new tricks. Sticking with the same old tricks is boring, though, so there's quite a bit of motivation to challenge yourself and learn new ones. Learning new programming tricks can also be difficult, but also necessary. If you don't take the time to learn new languages and frameworks, your skills will stagnate and programming could become quite tedious. Overcoming the difficulty of expanding your bag of tricks is well worth it. Don't let the fear of temporary awkwardness stop you. You'll get past the initial pain of learning something new, and you'll be a stronger programmer when you're done. Juggling has a natural progression. Start out passing one ball back and forth between your hands. Then add a second. Once you're comfortable with that, add the third. Then try juggling two balls in one hand, then two in the other hand, and then try two in each hand at the same time. Once you can juggle four at once, add a fifth. You can also branch out into bounce juggling or juggling clubs or passing with a partner. I'm drastically oversimplifying, of course, but the point is that there is a definite progression to getting better at juggling. I don't believe that learning to program has a natural progression. For every programmer, there is likely a different path to getting where they are. But there are parts of programming that do have progressions. When you're trying to refactor a section of code, even if it is a great big tear-up and redesign, there is likely a natural progression that will get you from the current code to the desired code through a series of smaller, simpler steps that maintain working code. If you can find that progression, you can make your life much easier because you'll know everything is working at each step of the way instead of doing a major overhaul and finding that nothing works at the end. Take the time to find that natural progression. Improvements come suddenly and without warning. When I was first learning to juggle three balls, I would keep a running count of how many throws I successfully caught. It was slow going at first, and I felt like I was stuck at six throws for a long time. Then all of a sudden I could do 15 throws, and I was stuck there for days of practicing. Then I jumped to 25 throws without consciously doing anything differently. Once I took the step beyond 25 throws, I could basically juggle three balls as long as I wanted, and I stopped counting and moved on to other tricks. None of these advances were gradual. It was as if the motions had suddenly sunk into my muscle memory, or some subtle change improved my efficiency of motion, and I took a big leap forward in skill. I noted that when learning the guitar, techniques or pieces of music that were once difficult could become easier without noticing. Juggling isn't like that because the feedback is immediate and obvious. You have an absolute reference to always compare against: are you keeping everything in the air, or not? Programming can have absolute references like that, too. Can you suddenly write 100 lines of code without making any syntax errors? Or maybe you've done a large refactoring without introducing any new bugs. Or you've become so proficient with a new framework that you can keep coding without having to look things up in the documentation. These kinds of improvements will all be immediately noticeable. Experiencing these leaps in programming skill is quite satisfying. Something clicks, and suddenly you can do things that you previously only admired in more experienced programmers. Keep practicing, work for those improvements, and your efforts will be rewarded. I read a lot. I love books, both technical books and novels, and over the years I've found that it is by far the best way for me to learn new things. Partially due to my obsession with learning from books, it took me longer than normal to discover that blogs are another great resource for learning, but in a different way. Blogs are good for getting insight into the culture of a field, for keeping up with the most recent developments of a topic, and for participating in a discussion with the community. Blogs are not better than books. They are a different medium for the dissemination of knowledge, and certainly will not be replacing books. In fact, they compliment books quite nicely. The medium they seem to be replacing is periodicals. Joel on Software - This is a great blog to get started reading software blogs. Joel Spolsky is an incredibly good writer. His ideas on software design and development, project management, and leadership are delivered with vibrant examples and clear reasoning. Plus, you get to experience the growth and development of his software company, Fog Creek Software, almost first hand. It's a fascinating look into how a real software company can start from almost nothing and grow organically through hard work and determination. I'll warn you, by the end you'll likely be convinced to start using his company's software products, or start your own company. Coding Horror - Whereas Joel clearly entered blogging with strong opinions and an excellent, fully developed writing style, Jeff Atwood seems to have started blogging with the intention of exploring and developing his ideas and improving his writing. His first posts were stilted and awkward, but with years of practice he became a great writer who could clearly express his thoughts with sharp reasoning and emotional force. It was inspiring to read along and witness his evolution as a writer and a software developer. During the course of the blog, an idea for a software company occurred to him and he decided to run with it. He partnered with Joel Spolsky and together they created Stackoverflow and the Stack Exchange network of Q&A sites. He went on to other pursuits as well. The entire progression of his career is an excellent read and quite enlightening. Paul Graham's Essays - Like Joel Spolsky, Paul Graham started blogging as an excellent writer. However, his focus is quite different. Instead of slowly growing a small company into a sustainable business, Paul writes convincingly for the flip side of the coin - the fast-growing startup. He relates his own experience running ViaWeb and selling it to Yahoo!, and shares an ongoing stream of great insights for running a successful startup. A few years into his blog, in the summer of 2005, he puts these ideas to the test by starting a startup school called Y Combinator. The school starts small, but after gaining a lot of inertia, it now turns out dozens of startups per year. Reading about the whole theory and process behind it helps you understand this part of the business world better, and it's a great contrast to the slow and steady way of starting a company. Stevey's Blog Rants - Steve Yegge's articles are spread across multiple places. The bulk of them are at his Blogger site, but he also has some posts on his Google+ site (+Steve Yegge), and a bunch of articles that he wrote while working at Amazon are stored at Stevey's Drunken Blog Rants. He now works at Google, and he writes a lot about programming language design, working at large software companies, and staying current as a software developer. His posts are filled with wisdom, wit, and sarcasm, and they are long. He packs them so full of information, and he is so entertaining that I don't mind that a bit. He's worth a read if only to get a clear view of the programming language landscape delivered with a healthy dose of cutting satire. The Conscience of a Liberal - This is not a technical blog, but it will flex your logic and reasoning skills. Paul Krugman's blog is a wickedly smart critique of modern economics and politics, and he doesn't pull any punches. If there's some policy he doesn't agree with, and there are many, he'll explain every deficiency and delinquency as clearly as you could possibly imagine. It doesn't matter if the ideas are coming from the left or the right, if the logic and reasoning are wrong, Krugman will neatly tear them apart. He always backs up his criticisms with solid data and a tremendous command of the English language, easily making him the best writer in this list. Reading him will teach you how to deliver an argument. He also shows a sharp wit combined with an expansive cultural knowledge that is always entertaining. The true mark of wisdom is shown when someone can explain complex topics simply enough that anyone can understand them, and Krugman delivers this in spades. This blog and his weekly columns are an extremely worthwhile read. Bruce Bartlett - Economix Blog - Bruce Bartlett is a conservative economist who has served in the Reagan and Bush I administrations as well as the staffs of multiple Republican congressmen. His writings are a study in how to let the data do the talking, and he often advocates solutions that you wouldn't expect of a conservative. His reasoning is always straightforward and nonsense-free, and he has an amazing store of political and economic historical knowledge that gives his writing excellent context. He steadfastly lets the facts determine the most rational policy recommendations without letting his own subjectivity intrude. Reading his posts will give you a firm appreciation for careful analysis and measured conclusions. Even though two of these blogs are about economics instead of software, they all have much to teach you about how to analyze incomplete data, reason about problems, and express your ideas in good writing. These are invaluable skills for every software developer. Each of these blogs contains a wealth of knowledge written in their own unique, engaging style. They are a pleasure to read and learn from, and following their progression over the years has been a real treat. All of them have challenged my assumptions and changed my way of thinking for the better. Check them out and give them a chance. They won't disappoint. I just had a wonderful experience leasing a car for the first time. Isn't it beautiful? I'm starting to think of it as our turtle hot-rod since it looks nice and sporty in red. We spent the afternoon at Smart Toyota in Madison, where an excellent salesman by the name of Justin Jackson helped us through the trade-in and leasing process. I brought along an internet quote, and the negotiation process was smooth and pleasant. The hardest part of the whole process was keeping the kids under control, but they were excited about the new car and Justin was happy and accommodating the entire time. If you're in the area and looking for a car, Smart Toyota and Justin come highly recommended. We decided to trade in our aging Toyota Corolla before it lost all of its value for something with better fuel economy. Right now the Toyota Prius is still the king of that hill while still having the range for longer trips, but things are starting to change rather quickly with more hybrids and electrics coming out every year. That environment of change and the fact that the Prius might be right for our family now, but not once our kids are a little bigger, contributed to our decision to lease instead of buy. In another few years there may be a viable hybrid minivan. They already have them in Japan. Or something like the Prius V could get more fuel efficient. Or we might see more electric cars with a 300 mile range that are a bit more affordable than the Tesla Model S. That last one's probably wishful thinking, but six years out, it's a much more likely possibility. The auto market is changing faster than it has in decades, maybe even its entire history, as more manufacturers are jumping into the hybrid/EV market and competing on mileage, charge time, features, and range. Three years ago plug-in hybrids didn't exist. Now there's half a dozen of them with more on the way. Manufacturers are converting more of their models to hybrids at an increasing rate, and once a model is a hybrid, it's a natural progression to make it a plug-in. It's becoming obvious that there are two paths to a fully electric car future. One is adding battery capacity to plug-in hybrids until the gas engine is no longer needed. The other is increasing the range and charging speed of fully electric cars until they can be useful beyond the daily commute or running errands around town. And as battery research and manufacturing gets more focus, charging times and prices are going to drop precipitously. The Nissan Leaf already shaved 4 hours off of its charge time and $4,000 off of its price in one year. I don't think it will be long before we see more extensive use of solar panels to extend driving range as well. With panel efficiency going up and prices coming down, it will only be a matter of time before someone decides to put a bunch of them on the roof of an electric car. Seems like a no-brainer to me. With all of these changes happening in the course of months instead of years, and gas prices continuing to increase, it no longer seems like driving the same car for a decade is a rational, cost effective option. Can Leasing Really Be a Cost Effective Solution? Like a lot of people, I used to be very skeptical of leasing. I didn't even consider it when buying a Nissan Leaf last year, but I probably should have. I harbored a basic assumption that leasing was more expensive than buying when you're planning on driving a car until it falls apart. It seemed quite logical, but I never ran the numbers. I didn't really run the numbers in detail until after leasing the Prius either, because the changing auto market was reason enough to not want to be committed to one car for a decade or more. I read up on leasing, mostly from LeaseGuide.com, which I highly recommend, and then jumped in and tried it. I did some detailed calculations after buying the Prius, out of curiosity, and surprisingly I found that leasing three times was basically equivalent to buying a car and driving it for nine years. After that, a fourth lease may still have similar costs because the maintenance costs on a 9-12 year old vehicle can really start to add up. Here is a run down of how I came to that conclusion, starting with the total cost of owning a Prius for nine years. How Much Does Nine Years of Prius Ownership Cost? 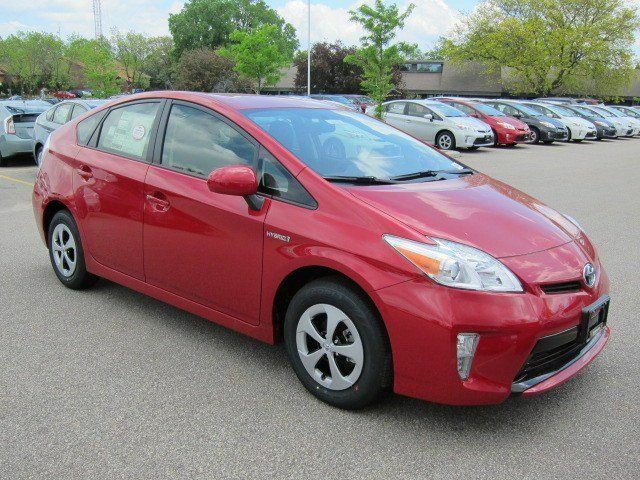 You should be able to get invoice on a Prius II that you're buying off the lot. The dealerships are overflowing with them and will be happy to let one go for that price. Now let's talk maintenance. You can buy a ToyotaCare maintenance package to pay for maintenance up to 45,000 miles. It's a good idea because it forces you to at least take the car in for recommended maintenance for that amount of time, and it costs a bit less than if you pay for it at the maintenance check-ups. It will roll into the loan so you'd be paying it over the life of the loan anyway. I'm ignoring title and license fees since they are the same between buying and leasing, and I'm assuming you can get away with no down payment on the loan. If you need a down payment, that's going to make buying look worse, as you'll see later. How About Three Leasing Terms? Leasing is a little more complicated in some ways, but less in others, specifically in the maintenance area. If you always purchase the maintenance plan, you'll pay no service fees and the car is always under warranty for the length of the lease. To calculate leasing costs, we need to figure out the monthly payments. These payments will consist of a depreciation fee and a finance fee. The depreciation fee pays for the difference between the value of a new Prius and the residual value after the lease term. The finance fee is basically the interest rate on the depreciation fee. The residual is interesting because this price is also the price you would pay at the end of the lease to purchase the car. If you decide you want to keep the car, this is the price you will pay, guaranteed. You won't be able to find an equivalent used car at the same price if the auto manufacturer was right about the depreciation. If their estimate was high, you can turn the car back in and they will have to deal with the car at its lower value. You ended up paying less on the lease than you should have, and it will be their loss. More likely their estimate was conservative to reduce their risk, and the car is worth more than the lease residual. You can trade in the car for some extra cash at the end to put towards the next lease. So three leases costs only $1969 more than buying and $3385 of the leasing cost is extra gap insurance and maintenance plans, which add real worry-free value. Plus, you're getting to drive a car that's always less than three years old and has the latest safety features, comfort improvements, and mileage gains. At this point leasing is already looking better than buying, but the costs are basically equivalent. What Could Tip the Balance? There aren't many things I can think of that could make the lease worse than it is. As long as you're careful about the lease terms, it offers a very stable stream of payments with no surprise costs. That alone is quite valuable because your monthly payments will be entirely predictable, and you can budget for them. They are a known quantity, and they are guaranteed to be lower than loan payments for the same car because you are effectively spreading payments over nine years instead of five. Even if you get in a bad accident, the lease should be the least of your worries, as long as you have gap insurance. The health and safety of everyone involved would be the primary concern. The worst that would happen with the lease is the car would be scrapped and you'd have to start over with another lease. Hopefully you could still get approved for another one. If that same accident happened on a loan, you'd have to start over with a new loan on a new or possibly used car, at significant cost to you. You can't get 0.0% APR. Even if you can get 1.9% APR, that removes the last of the savings for the buy scenario above because you're paying an extra $1,255 in interest and your monthly payments are higher. If that extra money was invested instead, it would amount to another $840 so the higher interest rate would cost you a total of $2,095. You need to give a down payment. Not only do you need to pony up that cash at signing, but you also could have invested that money instead. I'm not going to go through that calculation in full because it would lower the monthly loan payments and change all of the figures above, but consider that a down payment of $2000 invested at 8% for 9 years will net you $2100 in interest. The basic rule of thumb is you want to save more now, if you can, and spread spending over as long a period of time as possible. The car is worth less than anticipated. A lot can go wrong in nine years that is completely out of your control. Accidents, dings, dents, scratches, and faster depreciation can all reduce the value of your car. These things can affect a lease, too, if they fall under excessive wear and tear, but if you get these things repaired, return the car in good condition, and it loses value faster than expected anyway, the leasing company will have to eat the cost. Something goes wrong outside of warranty. Again, a lot can go wrong in nine years, and six of those years are outside of warranty. If mechanical problems start to crop up after the warranty is done, repairs can get very expensive in a hurry, and you have to come up with the money all at once instead of having regular monthly lease payments. Gas prices keep going up. With leasing, you have the ability to trade-in to a more fuel efficient car every three years. The savings in fuel costs could easily make the switch worthwhile. Cars are getting more efficient. As I said at the beginning, in a few years you may be able to lease a fuel efficient hybrid or electric car that didn't even exist before. If you bought your car intending to drive it into the ground, you'll have to try trading it in or live with the car you have as gas prices rise and newer cars get more fuel efficient and cheaper. After considering the downsides of leasing, I figured that almost all of them are intangible or don't apply to my situation. Your circumstances may vary, but as long as you have good credit, are going to drive within the mileage limits, and are comfortable committing to a lease for three years at a time, you'll probably find that leasing is at least as good, if not better than buying in financial terms. This finding caught me by surprise. I chose to lease this time to avoid the hassle of trading in cars more frequently to keep up with new developments. The added comfort of knowing I quite likely won't lose money in the process, and I have predictable, low risk monthly payments, all combine into a pretty sweet deal.